Well... I don’t know with you but I will shoot in the New Year with the latest release from the Italian metal band ELDRITCH. 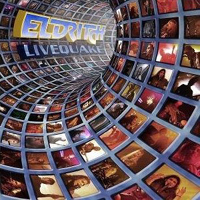 ‘Livequake’ is the title and contains 2 CD’s and a live DVD. I do not have the DVD in my possession but I can tell you a little about the two CD’s. ‘Livequake’ was recorded live during a show in the Music Street Live club in Lugnano/Pisa. CD 1 concentrates on the last 4 albums; ‘Reverse’ (2001, ‘Portrait of the Abyss within’ (2004), ‘Neighbourhell’ (2006) and ‘Blackenday’ (2007). CD 2 contains tracks from their first 3 albums; ‘Seeds of Rage’ (1995), ‘Headquake’ (1997) and ‘El Nino’ (1998). CD1 is my personal favourite and it’s not bad what the guys have delivered here. Tracks like “The Blackened Day”, “Silent Flame” and “Save Me” comes down quite fine live. Yes I do prefer their latest stuff. The songs from the latest 4 albums all contain catchy and from time to time thrashy guitar riffs... and quite depressive lyrics. Yeah... I like that LOL. CD 2 is the most progressive one and I must admit that I still have to hunt down ‘El Nino’ an album I haven’t heard one single track from before now. Most of the songs from CD 2 are taken from... ‘El Nino’ and crunchy riffing are all over the disc. Nice. Now I REALLY have to hunt ‘El Nino” down. My only problem with this album is that singer Terence Holler sounds a bit better on the studio releases than live… but what the hell… ‘Livequake’ is still one fine piece of a metal release that will find its way into my CD-player from time to time.